Between 1939 and 1960, the years spanning Ted’s career with the Red Sox, Boston had eight major newspapers, or nine if one counted both the morning and evening editions of The Boston Globe, which had separate staffs and circulations. The morning papers were the Post, the Herald, the Record, the Daily Globe and the Christian Science Monitor. The evening journals were the American, the Transcript, the Traveler, and the Evening Globe. The Post and the Record dominated the city in 1940 with circulations of 369,000 and 329,000 respectively. In the ’30s, ’40s, and ’50s, major league baseball was by far the dominant sport in the country, and would often take up a third of the front page of newspapers in Boston, New York, Chicago, and Philadelphia. To be a baseball writer assigned to cover one of the big league teams was a highly prized assignment. The writers wore suits. On long road trips, they’d play poker on the trains with the players and among themselves. Some great yarns came out of those trips, but in the fraternal milieu, it was understood that the stories would stay in-house, never to turn up in print. On average, the writers were a generation-or-more older than the players they covered. Before World War II, the vast majority had not gone to college, and in the ’40s, their salaries ranged between $5,000 and $7,000 a year. But you couldn’t beat the perks. In what seems a quaint anachronism today, it was common practice at least into the ’60s for the ball clubs to pay all the expenses of the writers when the teams traveled. The reporters would stay at the best hotels, order from room service, and eat at fine restaurants. Moreover, they spent six weeks in Florida for Spring Training on the teams’ tab as well. In return for such largesse, the clubs of course expected, even demanded, favorable coverage, and they received it. On the rare occasions they did not, the teams would not hesitate to assert their economic leverage over the papers. 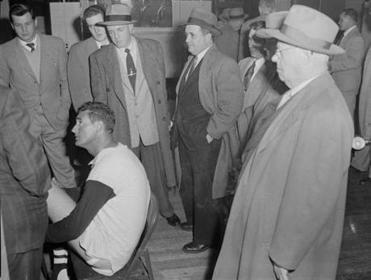 Ted Williams surrounded by the gentlemen of the press. What a surprise that Bradlee, a Boston journalist, would refer to Williams’ unjustified “jihad against the press”! Next, we will have Roger Ailes referring to Obama’s unjustified jihad against Fox News. Williams won the Triple Crown one year and lost the MVP award–voted on by sportswriters– because a writer did not even place him anywhere on the ballot and not enough others placed him first. He also did not win the MVP in the years he hit .388 and .406. If those sportswriters wee imaginary enemies, I hate to imagine what real sportswriter enemies could do. Williams was, admittedly, a high stun, cranky perfectionist who did not bother with the PR phoniness perfected by Michael Jordan and others. Then again, he also never complained about his service in 2 world wars preventing him from breaking the all time home run and runs batted in records. How do you think a current superstar would react to being called for combat duty at age 33? I’d take Stan Musial over Ted Williams any day. He was complacent it the hoax that was Ted’s “feud” with the sportswriters. Selling more papers was the shtick and they all played their parts well.